AG Gallery/About Glamour in Williamsburg is pleased to present a solo exhibition by a unique collage artist, Maureen Shields. 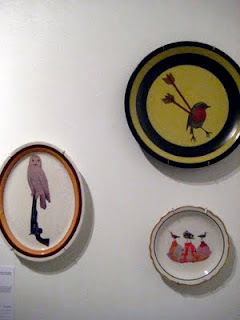 We exhibited one of her signature media of artworks, collages on wood panels and on vintage dish plates on this show. The intent of her work is twofold. First, she hopes to initially attract and ideally seduce, as well as engage the viewer with surface, color, and beautiful and interesting objects. The tone of her work is often at first glance innocent and cheerful. Second, what follows this initial reception of a playful, nearly saccharine veneer is a deeper invitation into a strangely constructed world. The viewer is caught between a delight in the fantastic and a sense of unease or menace. The animal motifs she employs in the work, often times emphasizes the idea of the animal kingdom rather than actual wildlife. 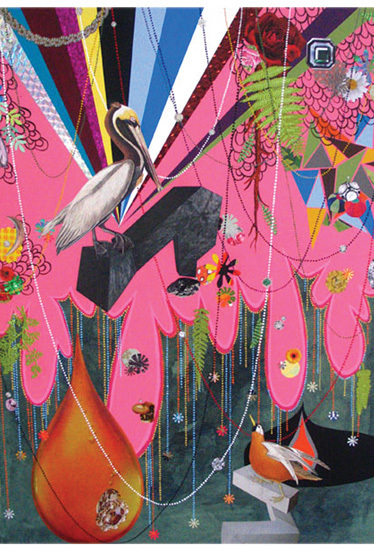 Her art works to balance between the whimsical, the grotesque, and the commonplace. She hopes to skew perspective and she seeks to reintroduce the strangeness and complexity associated with childhood without projecting directly onto the specific. her works on our silent auction. Born in San Gabriel, CA. She lives and works in San Francisco, CA. Her successful eight solo exhibitions were held in California and New York through 1994 to 2011. Her artworks also made appearance in various group exhibitions, mainly held in California. Her signature artworks are colleges on different materials such as wood panels and vintage plates.